When Kings Creek Country Club opened in 1990, the 350-acre property was a major part of a new wave of expansion in the Cape Region. Along with dozens of custom home sites, the developers also created a challenging 18-hole golf course wending throughout the property. The course went through several alterations since then, such as changing its nines at least twice, replacing one hole with another in a different location, and a tree and brush removal project to restore turf health and playability. Last year Kings Creek began a major renovation program with the creation of a significantly expanded practice area adjacent to the clubhouse and the first and sixth holes. This was the first stage of a complete redo of other improvements, such as a replacement of the bunkers throughout the course. A new fairway bunker on the par-5 third hole at Kings Creek CC. I spoke recently with course superintendent Mark Haschemeyer about the changes, and with Joel Wieman of McDonald Golf Inc., the design/builders for the reconstruction. “It’s a lot more open, I think,” Haschemeyer said as we toured the front nine. It’s also a much fairer course for higher-handicap players, while retaining skills challenges preferred by better golfers. Part of these alterations relate to the appearance of the bunkers as well as their locations. The new bunkers are deeper, with distinctive high flashing of sand on the sides. The bunker shaping at the edges is also designed to help keep water from draining into them from elsewhere. The Billy Bunker system uses a polymer treatment on the stone layer to hold the large gravel in place and permit faster drainage with fewer clogging episodes. Haschemeyer said the flashing sides also use half the depth of the sand at the bunker bottom. When the new Valley Forge Blend sand firms up, shots that hit those high sides should roll down to those bottoms, making it easier to recover. Weiman said one reason for the high-sided design was to increase the visual appeal of the course. “They’re quite big and bold,” he said. 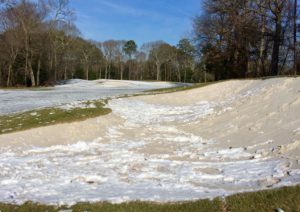 Weiman also said they relocated several bunkers to tighten the angles favored by the better players, while eliminating others where only the golf balls of higher-handicap golfers were likely to land. He said that overall they reduced the square footage of sand on the course by 35 per cent. Haschemeyer said the front nine renovations reduced the bunkers from 45 to 34. For example, short-hitting golfers often watched their tee shots land in the bunkers on the left and right side of the fairway of the par-4 fifth hole. Longer hitters could easily hit over those bunkers to a much wider fairway. The renovation for that hole removed several trees that created a chute-like effect from the left side, eliminated those two fairway bunkers, and created a new fairway bunker that lower handicap golfers cannot ignore. The par-3 seventh hole now features a wider apron in the front, which makes approach shots a bit easier. Haschemeyer said that change also helps reduce turf wear at that location. They also reduced if not eliminated a drainage problem affecting the left front edge of the green. For the par-5 eighth hole, shorter hitters going a bit right off the tee often landed in a large fairway bunker. That bunker was removed, giving these players a chance to hit a decent second shot to make a third shot to the green a better possibility. A new right side fairway bunker sits a few dozen yards further out than the old one, but a drive that comes close to its left edge is the best line off the tee. Weiman said this and several other changes should provoke an interesting risk/reward decision for longer hitters. Newly sodded bluegrass at some locations, such as between the second green and the third hole tee boxes and between the first and sixth fairways, extends the fairway look well beyond the previous design. Weiman said they wanted to create a more seamless look to the course. At some spots this also expands recovery options, instead of forcing a shot out of deeper rough. The always-difficult par-5 third hole running along the property’s western edge incorporated many of these changes. Haschemeyer said redone tee boxes help aim tee shots to the center of an expanded fairway landing area. A new tee box also shortens the hole slightly, and provides better sight lines. More rough areas were sodded and flattened a bit off the left side of the fairway. Near the 150-yard mark two left side fairway bunkers were removed, with a new right side bunker on the hill where many golfers formerly tried to bounce their second shots. The renovation encourages golfers to place their second shot short or left of that bunker, while the more adventurous have a better chance for a shorter pitch to the green. The greenside bunkers were also changed completely, and supplemented with expanded chipping areas. Whenever I played this hole a bogey felt almost like a birdie. The changes to this par-5 are both visually striking and welcome. The next round of renovations should produce similarly pleasant reactions elsewhere on this fun but demanding layout.